Mai Long is an artist friend of mine. You might have seen her on TV in the Lonely Planet show about Sydney Australia. Mai’s work quite often addresses her cultural identity issuses. I own a few of Mai’s works. Here’s a some pictures of them. I will be aquiring a few more of Mai’s works over the next couple of months and I’ll post pictures of them here when I do. I’m tossing up about whether I get some more paintings or some sculptures. The image is made up of 8 photos that were stitched together with Canon PhotoStitch. I’m not saying that this is great expressive photography, after all it’s just a matter of be there and take the picture like most other landscapes (or skyscapes if you want to be picky). For me this is a record of another beautiful scene I’ve seen. It’s all about “be here now”. 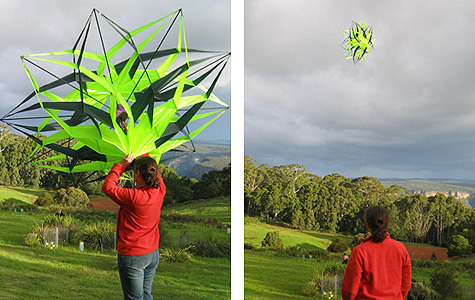 Over the last month my wife and I constructed a new kite. The material is ripstop nylon and the poles are made of carbon fibre. The kite is 2M across. We finally got to fly the kite on the Easter weekend. Naturally the wind speed dropped (as is the way of the world) as soon as we brought the kite out and it hasn’t been windy enough to fly it again for the last three weeks.